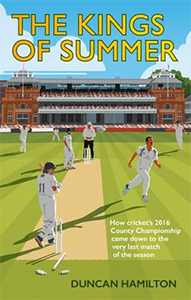 Award-winning author Duncan Hamilton has, in this almost pocket-sized book, relived the final four enthralling days of the 2016 County Championship season. Three sides had a chance: Yorkshire, looking for a hat-trick of titles; Middlesex, their opponents, looking for their first Championship since 1993 and Somerset, bridesmaids on many occasions, still seeking their first. Middlesex and Yorkshire would play each other at Lord's where the author spent four engrossing days. I see that Duncan comes from the north but, if he did have any leanings, they do not really come across and the essence of The Kings of Summer is in the joy of the County Championship. We realise that we live in the era of quick-fire games over in three hours and Duncan's book is an important reminder that there is another tournament - dating far further back than the comparatively recent advent of Twenty20 - also played during our summer which can give longer-lasting drama and enjoyment. In The Kings of Summer, Duncan naturally and expertly chronicles the Lord's match whilst keeping an eye out on Somerset's progress against Nottinghamshire. As seemed to be expected, Somerset won very comfortably leaving a victor in the Lord's match to thwart their Championship hopes again. Yorkshire needed in their first innings to make 350 without which they would have had no further interest in the 2016 season. They had an alarming collapse before Tim Bresnan led the recovery but their ninth wicket still fell at 334. Bresnan and Ryan Sidebottom eased their way towards the landmark figure before an unsuccessful lbw appeal and a rain delay came with the score at 349. So many emotions over a full four days which Duncan describes admirably. That Yorkshire went on to 390 meant all three counties were still in with a chance of the Championship on the final day of the season. We know now that the title was ultimately claimed by Middlesex in the last few overs of the season courtesy of a Toby Roland-Jones hat-trick. Lest we forget, cricket does have the ability to sustain interest and excitement in the longer version of the game and The Kings of Summer will, one hopes, help to extol the version of this format of the game. How often did so many spectators descend upon a County Championship match? It seems that, until this match, Duncan was not possibly the most comfortable visitor to the Home of Cricket but, fortunately, no longer. He also talks about famous cricket paintings and suggests this match deserves one. Laurence Whiteley's jacket illustration strikes me as being a pretty good reflection of the match and, when I first saw the book, I could immediately place the scene. I, a fan if not a frequent visitor to County Championship matches, was drawn to my M.C.C Membership pass in search of a suitable date for a further visit to Lord's for a day watching a County Championship match. June offers Middlesex playing the same protagonists and, due to Duncan Hamilton's The Kings of Summer, I may just be there.